I recently migrated my personal WordPress.com blog over to a self-hosted blog, only because a domain that I’ve been stalking for some time recently became available. One of the constraints with using the migration tool supplied by WordPress, is you must use the same permalink structure that is used on WordPress.com. I wanted to change this permalink structure to be a little more SEO friendly, so I updated it about a month after my initial migration to use the “Post Name” option that is available. 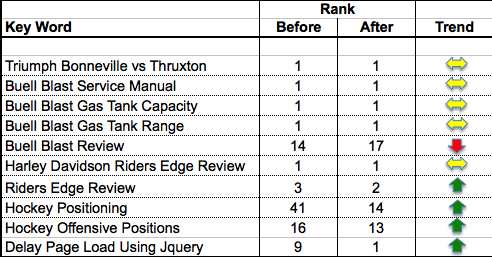 I thought this might be a good time to do a little case study on the WordPress Permalink Structure SEO impact of a permalink change for a few of the keywords I’ve been tracking. When you migrate from WordPress.com using the site migration upgrade, you are required to use the same permalink structure that was used on your WordPress.com blog. I described that in detail in my post on implementing the site redirect upgrade. I was wondering about the WordPress Permalink structure SEO impacts on my ranking, so I documented the search results for 10 of my favorite keywords. Is the “Post Name” option really that much better for SEO than the “Day and Name” option? After waiting a few weeks, I had my result. As you can see, it does make a difference. In all cases but one, which I’ll describe more below, the permalink change either had a positive impact or no impact at all. For 5 of my keywords that were already ranking #1, there was no change. For 4 of the keywords, there was a positive change and in 2 of those cases this change was dramatic. So what about the one keyword that didn’t fare so well? This keyword had a decline of 3 positions in the SERP’s. I don’t believe this is a result of the permalink structure change, but more so was a result of some minor tweaking I did to the posts content right after I made the permalink change. I realized, after the fact, that I shouldn’t have made any content changes, as this could have an impact on any search results. 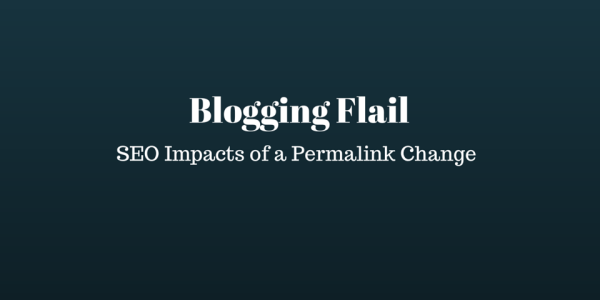 So is there a WordPress Permalink structure SEO impact? I’m convinced there is, and wouldn’t hesitate to use the “Post Name” permalink option on any other blog I’m using. If you throw out the one keyword that I consider being invalid for this test, there was either a positive or no impact in 100% of all keywords I tested. I agree that from an SEO perspective, using the “Post Name” permalink structure is optimal. However, if you use ONLY the “Post Name” option, your site is going to slow down progressively as the number of posts increase. Why? Because when the WP back-end searches through content, and posts or pages with the same or similar titles, it causes confusion as it sifts through, trying to discern which is which for a specific word, title, etc. In order to eliminate this problem you have to make each post unique. I prefer to use the “Post ID, Post Name” for the URL structure by using ” /%post_id%/%postname%/ ” in the custom URL setting. Thanks for the comment Scott. Not sure how I missed this earlier, but somehow it ended up in my spam folder. Good thing I check that. Interesting perspective. I wonder what using the Post ID / Post Name option as you specify does to your SEO. That would be a good idea for a future case study. Thanks for sharing that. I think the best way is to go with /%postname%/%post_id%/ as permalinks.PostID is very crucial for news publishing plaform or news related blogs.For 5 or 10 articles I think %postname$% is doing fine. 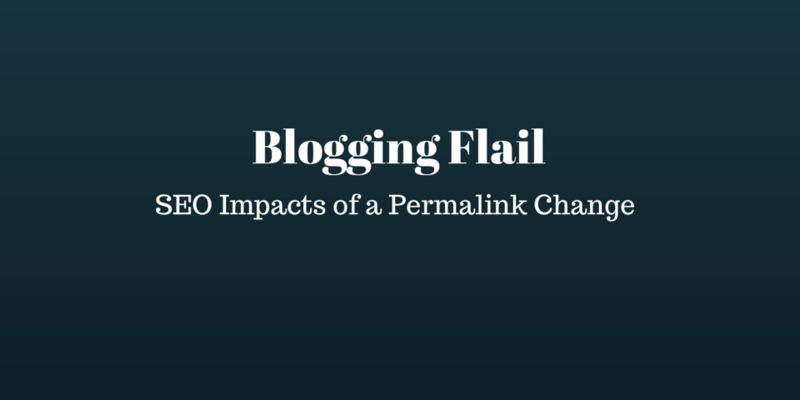 Blogging Flail is aimed at those bloggers that are frustrated. Frustrated at not getting visitors to their site, frustrated at not receiving comments, and frustrated because they are not getting email subscribers. You can keep on doing what you've been doing, or you can try a different strategy.